14 years, 4 months, 13 days old age. Bella Angel will turn 15 on 09 December, 2019. Only 7 months, 16 days, 10 hours, 29 minutes has left for her next birthday. Bella Angel has celebrated the total number of 14 birthdays till date. See the analysis by days count and bar graph. Bella Angel was born on 09-12-2004 in Sao Paulo, Brazil. She is a Brazilian Singer & Songwriter. Bella Angel was introduced to music from a very age by her father. She started singing duet's with her sister and started posting them on YouTube and became a famous YouTube star. Her self-titled YouTube channel has nearly 300K subscribers and she has also associated with other YouTube stars as well. Her father Thiago Abreu is a funk artist who is better known as MC Belinho and Daiane Glória. Famous Brazilian singer, songwriter MC Melody is her younger sister. In the initial part of her career, she used to post parodies and falsetto but later decided to post only original songs. 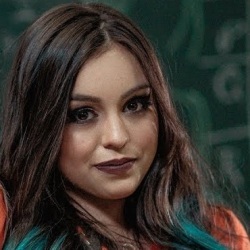 Her video "Melody e Bella Angel - Lembranças" has got the maximum hits on YouTube.